Other times are available by appointment! In addition to offering a variety of climate-controlled and non-climate-controlled units, Cottonwood Parc specializes in the storage of recreational vehicles. 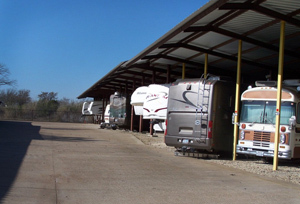 Our covered RV spaces feature angle parking for easy ingress and egress and plenty of room to maneuver. Spaces range from 14X40-feet to 14X50-feet, with electric and dump station amenities and water/washing hookups available. In business for 10 years, we offer conventional storage unit sizes measuring 5X10-feet through 10X20-feet. Contracts run month-to-month; ask about our long-term incentives. Located 3 minutes from the back gate of Pecan Plantation on FM 2455 and 10 minutes from Granbury, we are authorized to handle the delivery needs of commercial clients requiring drop-offs of UPS and/or FedEx packages. We also offer a variety of packing and moving supplies. Our manager is available daily to assist you. Customers can access their unit(s) until 10 p.m. via personally-issued gate code. Feel free to visit the facility for a walking tour and complimentary drinks/snacks or contact us via phone or email with your storage questions. 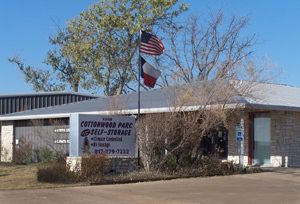 Cottonwood Parc is a member of the Texas Self-Storage Association, the country’s largest statewide self-storage organization. Founded in 1986, TSSA has been providing a variety of benefits to owners and operators in the Lone Star State for over two decades. TSSA today represents more than 3,300 member facilities committed to improving the competitive self-storage industry.